This stand folds up for easy transport in its own integrated case. 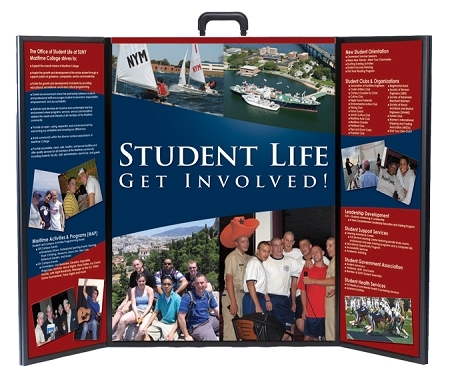 Shown with optional full color graphics that quickly attach with Velcro. When closed, the display is s a stylish briefcase with handle. Very easy to store and transport. 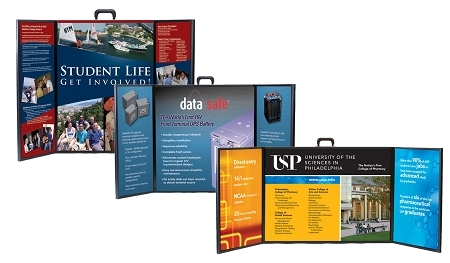 We show the unit complete with a set of full color graphics that easily attach or remove with Velcro. 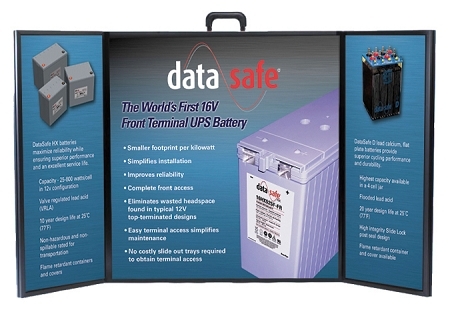 Your stand is shipped without graphics, although most customers choose to have us add a set of three photo quality graphic panels to their order. Graphics are printed direct to board on 1/8" white Sintra. If you order a header panel, please note that the half moon shape only is printed on Gator plast. Ink is fade, water and scratch resistant. The graphics attach with Velcro (additional) and are easy to change out in a moment's notice. The benefit of this item is that it doubles as a portfolio when closed with a carrying handle. If you would like a zippered nylon bag, please add this to your order. Due to the size of this item, an additional shipping charge applies for the delivery of the display unit, even if you are located in Atlanta. For orders shipped outside of Atlanta, your graphics will arrive separately from the display unit. Determine the case size you would like and remember that your case ships without graphic panels. If you would like to ad a set of graphics, choose this option as well. Design your graphics at the listed panel size above and be sure to include 1/8" bleed. Upload your file and place your order. Please allow 1 day for a pdf proof then 4-5 business days after proof approval to arrive to your door. Download a helpful tip sheet for this product!